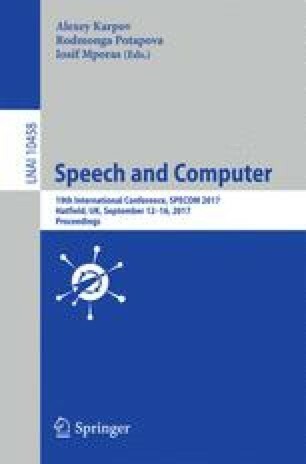 In this paper, we have been investigating an approach to a speaker representation for a diarization system that clusters short telephone conversation segments (produced by the same speaker). The proposed approach applies a neural-network-based descriptor that replaces a usual i-vector descriptor in the state-of-the-art diarization systems. The comparison of these two techniques was done on the English part of the CallHome corpus. The final results indicate the superiority of the i-vector’s approach although our proposed descriptor brings an additive information. Thus, the combined descriptor represents a speaker in a segment for diarization purpose with lower diarization error (almost 20% relative improvement compared with only i-vector application). This research was supported by the Ministry of Culture Czech Republic, project No. DG16P02B048.